Just because it’s getting colder and your co-workers are sniffling does not mean you have to be the next victim. Here are some natural ways to keep colds and flus at bay this season. 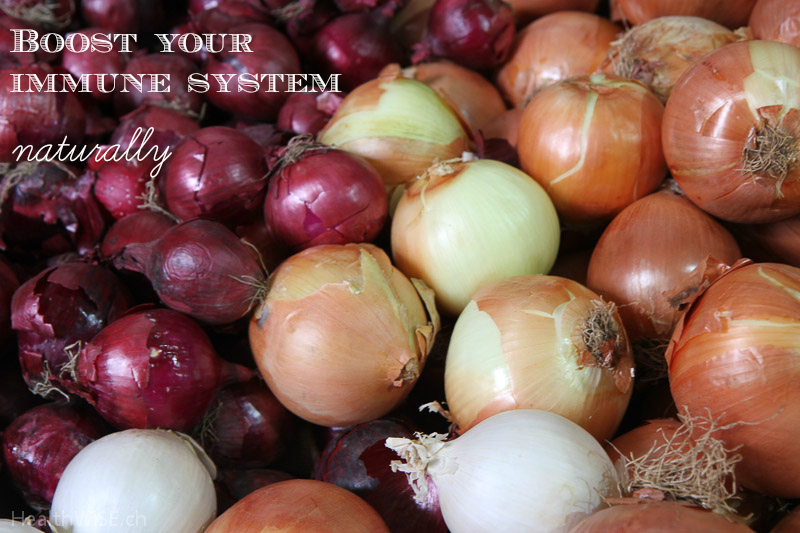 Vegetables from the allium family – onion, garlic, leeks, shallots, chives, spring onion – are amazing for boosting your immune system. Garlic in particular has been shown to fight bacteria, viruses, and fungi. So add these wonderfully pungent vegetables to your soups, stews, sauces and salads! Try my immune boosting stir-fry using these vegetables. Selenium is one of the most underrated minerals to help boost immunity, yet research shows that it helps the body fight everything, from cancerous cells to the common cold. The easiest and most delicious way to get enough selenium? Eat 1-2 Brazil nuts every day. Zinc helps keep the immune system functioning properly and can shorten the duration of a cold. Make sure you include zinc-rich foods in your meals such as lamb, beef, oysters, almonds, sesame seeds/tahini, pumpkin seeds, oats, turkey, green peas, pine nuts, spinach, beans and raw cacao. Mushrooms like shiitake can really give your immune system a boost. Add them to soups, stir-fry’s, sauces or as a side with eggs. Sugar actually decreases the ability of infection-fighting white blood cells to fend off harmful bacteria and viruses. Sugar is addictive, so the less you eat, the less you will crave it. It’s always important to listen to your body, but especially so when you need to fend off a nasty virus. Honor your body’s need for rest and sleep – most people actually need more down time in the colder, darker months. Say ‘no’ to activities when you feel the need to. We don’t necessarily associate stress with catching a cold or the flu, but stress actually lowers our immunity, making us more susceptible to catch what’s going around. Take a good look at your life and think of what activities you could say ‘yes’ to more often and what you could say ‘no’ to more. According to Ayurvedic traditions, ginger helps to cleanse the lymphatic system, which is our body’s sewage system. Adding ginger to meals, smoothies or even drinking it may help prevent the accumulation of the toxins that increase your risk of getting sick. Here is my recipe for ginger tea, which I make whenever I feel I might be coming down with something. Grate about 1 tablespoon of fresh ginger in 1 cup of boiling water for ten minutes. Cover to allow the ginger to steep, then add some fresh lemon and a little honey. Drink up to 4 cups daily. And if you do get sick despite your best efforts, my mother’s lentil soup will surely help you feel better! I would love to hear from you – how do YOU stay healthy in the colder months?